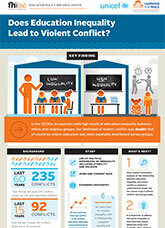 November 2015 — This infographic illustrates the findings of a recently published study by FHI 360’s Education Policy and Data Center (EPDC) that investigated the relationship between horizontal inequalities in education and violent conflict. EPDC’s findings showed that a high level of education inequality between identity groups predicts a substantially greater risk of violent conflict compared to the global average. The study involved the creation of a unique multicountry dataset of educational attainment disaggregated by race, ethnicity, religion, subnational unit, age and gender, which allowed researchers to overcome the challenges of limited data that inhibited previous studies.